Gypsy Lovell eyed the framed print hanging across the room. Daintily drawn letters spelled out what she assumed was part of a scripture. No scholar of holy things, she had still managed to absorb a few basic Bible facts in her twenty-nine-plus years, and after her move to Castle Creek, she’d met more religious people than she’d seen in her entire life. Besides, it made perfect sense that the quote would be a scripture. She was sitting in the bright, airy visitor’s lounge of Solomon’s Gate, a Christian dating agency that had taken the conservative town by surprise—and by storm—some months ago. Sharing the bold red-and-white striped sofa with her was the agency’s gorgeous, auburn-haired owner, Destiny Gallagher, whose round tummy barely made an impression under her oh-so-chic maternity top. For the past twenty minutes or so, Destiny had bombarded Gypsy with brochures and flyers and heartwarming testimonials, all touting the success rate of this fledgling business. Gypsy already knew most of it. She’d done her homework. The fact that Solomon’s Gate was a Christian-based company had been part of what drew her here. Though she had never attended a church service, she’d sought this place precisely because she knew most of the clients were religious. That made marrying a stranger, even temporarily, feel a little safer. Men who wore Christianity out in the open like some kind of badge had to be honest to a fault…or complete wimps. Both of those traits suited her purposes just fine. She nodded, and a huge fist squeezed her insides. If someone had told her two weeks ago that she’d be sitting where she sat right now, she’d have threatened to turn them into a toad. Not that she had the slightest idea how to turn a person into any kind of amphibian, but she’d been born with the sultry looks to match her ridiculous name, so people tended to suspect she might. Until now, Gypsy had no plans to ever be married. Watching her mother fade and draw into herself after being abandoned by the love of her life—Gypsy’s father—freed Gypsy of any illusions about romance in general, and certainly about happily ever after. But Destiny didn’t know that. And Gypsy wasn’t going to tell her. What on earth was the woman talking about? Unction? Holy Spirit? 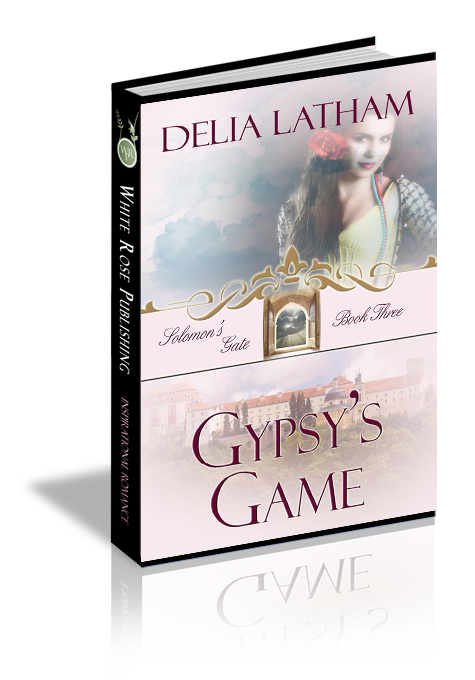 Gypsy stood and crossed to a window that offered a view of a huge, rolling green lawn. She had hoped not to have to explain herself in too much detail. Heaven only knew how much she needed to find what she was looking for in a hurry. She didn’t have time to go traipsing off to Sacramento—the nearest large metropolis—to find an agency without all the goody-goody hang-ups. “I—I beg your pardon?” Destiny stammered. Her elegant hostess seemed a bit ruffled. Oh, well. Something in the matchmaker’s somber gaze gripped Gypsy’s heart. Sadness? Pity? Whatever it was, it curled her stomach into a tight little ball and stung the backs of her eyes with forbidden tears. She bent to pick up her purse and slipped the strap over her shoulder, and then met Destiny’s gaze, which now brimmed with moisture. Oh, good heavens. Waterworks. Just what she needed. Gypsy sucked in a startled breath. She wasn’t fond of men, but she wasn’t blind, either. This guy left “mediocre” miles behind. He lolled against the door frame as if he’d been formed for no better reason than to stand there in that position. A pair of dark, impossibly beautiful eyes narrowed as he raked her face with a piercing gaze. A lock of deep brown hair fell over his forehead, and a five o’clock shadow lent a slight rakish look, which was further defined when his precisely molded lips curved into a crooked half smile. Gorgeous. The man was gorgeous, and he’d offered to marry her.